The apartment backs onto the garden of the complex and its picturesque stream. The property opens onto the hallway, furnished with a tree-shaped clothes hanger. The day area is composed of a white kitchen corner* (with washing machine, microwave, dishwasher, induction cooktop, frosted glass cabinets and sink) and a table seating up to 6 people. The relaxation corner is furnished with a double sofa bed, a round table with glass top, a pouf and a modern flat screen TV. The night area, complete with terrace, is composed of: -a master bedroom, featuring a double bed with a precious headboard, two bedside tables and a white ash closet with three sliding doors;-a second bedroom with two single beds (that can be combined together), a bedside table and an oakwood writing desk with a matching chair; -a bathroom with a tempered glass and iron shower stall, basin, wc and bidet. *The kitchen is not equipped with electric oven. 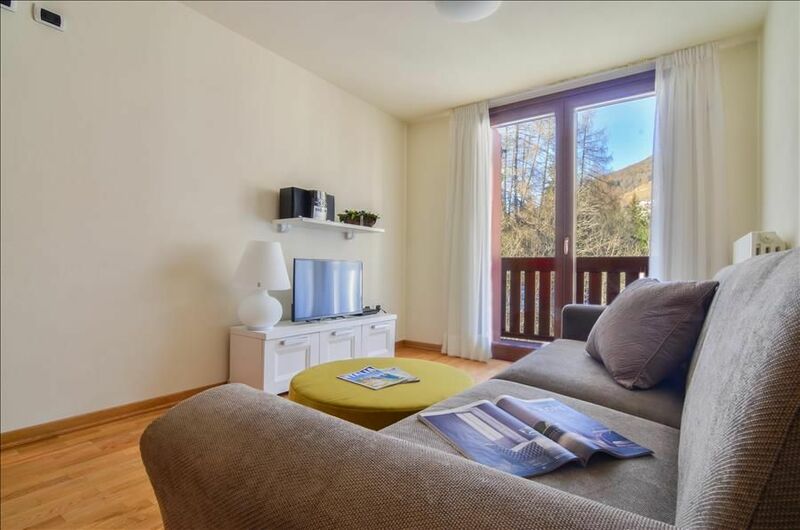 The apartment comes complete with a ski deposit in the common area on the basement. Area The town of Ponte di Legno is located in the upper part of Valle Camonica and it is the last and, for extension, its largest municipality. Completely immersed in a picturesque valley, Ponte di Legno is the natural border between Lombardy and Trentino-Alto Adige, through the Passo del Tonale. The Passo di Gavia connects the provinces of Brescia and Sondrio instead. Ponte di Legno is the most important ski resort in Lombardy (northern Italy), and it offers about a hundred kilometers of ski slopes with artificial snow-making system and thirty ski-lifts. A cable car allows to reach the Passo del Tonale in less than 15 minutes.The neighbouring woods of the Rhaetian Alps offer spectacular views that can be admired from the top of the Corno d'Aola. A bike and pedestrian track, which passes directly in fron of the complex, crosses the entire valley, along the River Oglio and through its picturesque villages.The Golf Club Ponte di Legno, surrounded by the Alpine peaks, offers an interesting golf experience, while the local sport center - with covered Olympic swimming pool and tennis courts - represents the perfect summer alternative for sport lovers.ParkingA private garage is available in the complex; at 50 meters you also find a public parking.Moreover, the shuttle bus connecting to the ski slops - located only 200m away - stops in front of the complex. La ringraziamo per averci dedicato del tempo per condividere con noi la Sua esperienza a Ponte di Legno. Siamo lieti che la zona, la casa e il Suo soggiorno siano stati di vostro gradimento e speriamo di potervi ospitare nuovamente presso le nostre strutture.